Great day at the Greenbrier Challenge. You could not ask for better conditions. The trails were fast but challenging. And the day? Beautiful. Sunny skies and comfortable spring weather. I had the honor of playing race announcer for the day and had a great time chatting with my MTB brethren. It’s amazing how much cross over now exists between mountainbikers and cyclocrossers. It used to be that a portion of every CX race field was MTB dudes. Now, the tide has turned a bit and more and more of the MTB fields are populated with ‘cross racers. With a day full of cat-herding, awards ceremonies, and DJ duties, there was not much time available to take many photos or shoot any video. I did have the opportunity to set up a camera and shoot timelapse sequences of the start of the cat 2 and 3 fields. Not much race action but it is a bit of a curiosity. Take a look. And thanks for stopping by. 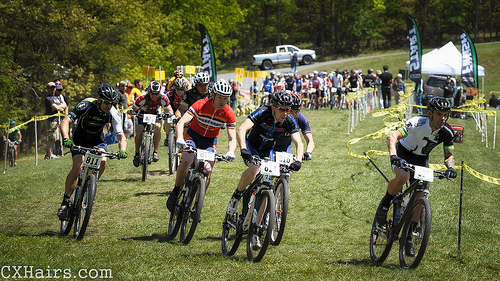 Greenbrier Challenge 2012: The Start from In The Crosshairs on Vimeo. great day for racing for sure!